The West Tennessee Travelers held their May campout at Branson, Missouri. Six units arrived Sunday all set to enjoy a week of all the attractions that Branson has to offer. We were joined by Chris & Betty Bradshaw from the Tidewater Tascos of Virginia Beach, Va.
America’s Best Campground is an excellent RV park located within easy driving distance from downtown and with easy access to the shows. They provided a convenient meeting place for our use at no charge throughout the week. In addition, tickets to most shows were available at the office at discounted rates. We met Monday morning at the pavilion for a continental breakfast and casserole provided by Cliff & Kay Klein. We spent the next hour planning our week. We decided on one meal and one show together and the remaining participation would be on an individual basis. Our dining experience was at McFarlain’s Family Restaurant in the Imax complex. The food was delicious and served quickly. As a group, we attended the show “The Duttons”. It is a family of 20+ very talented musicians and singers ranging in age from preteen to grandparents. We had one of our own participating in the “name that tune” contest. Way to go Mike!! !The remaining time we spent attending shows and museums according to individual tastes including country, pop, comedy and gospel music. If we tired of music, stage shows were available, including a stage presentation of “Samson” with terrific special effects and live animals roaming throughout the theater. When we needed a break from shows and museums, we toured downtown Branson which included the historic district located on the bank of Lake Taneycomo. This area features the famous Dicks Five & Dime, a must see attraction. 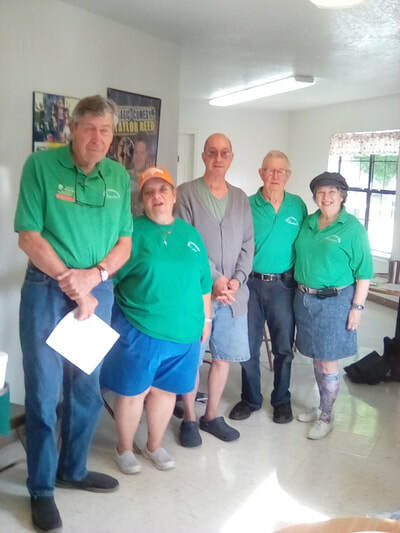 Since this was the last outing of our 2017-2018 fiscal year, Outgoing president Larry Bolding took the opportunity to officiate at the installation of our newly elected officers for the 2018-2019 season: Jeannette Dixon-President, Bob Walter-Vice President, Ken Dixon-Secretary, Judy Doyle-Treasurer. We also want to express our appreciation to Cliff & Kay Klein for their hard work in making this outing one of our best. ABC is "City Close--Country Quiet" at its convenient and scenic setting, just a short distance northwest of historic downtown Branson, Missouri. Enjoy easy access to and from the MO-248 (the Shepherd of the Hills Highway) and MO-65, which runs through downtown.